Last week we looked at CW’s childhood and early life. Next week we will discuss his final, most prolific years, 1939-1945. Today we examine the first phase of his career, 1908-1939. Please send me any questions you have about his life, and I will attempt to answer them in these pos ts. In 1908 Williams’ life changed drastically. He began work at the Oxford University Press on the 9th of June, and he met Florence Conway at a children’s party in December. 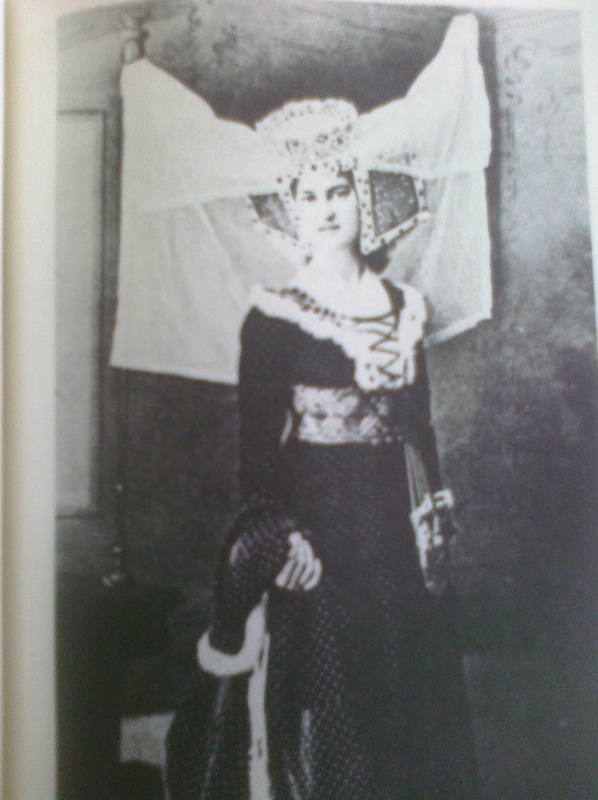 The picture at the right shows Florence in pageant costume. When Williams began work at the Oxford University Press, he found his life’s calling. He contin ued to work for the Press until the day he died, working his way up from a lowly temporary proof-reader to a senior editor. The Press embodied everything he loved most: order, hard work, literary excellence, camaraderie, hierarchy, courtesy. He transformed the Press as much as it transformed him, shaping his daily workplace into a heavenly fellowship where profound conversations occurred at every chance meeting, where people felt lifted up into their best selves by his gracious treatment, and where everyone was inspired by his frantic creative energy. He taught everyone their places in the divine order, writing plays in which they could enact the daily drama in high, ceremonial verse. He appropriated office time for himself, scribbling poetry on scraps of paper and writing book reviews on the company clock. 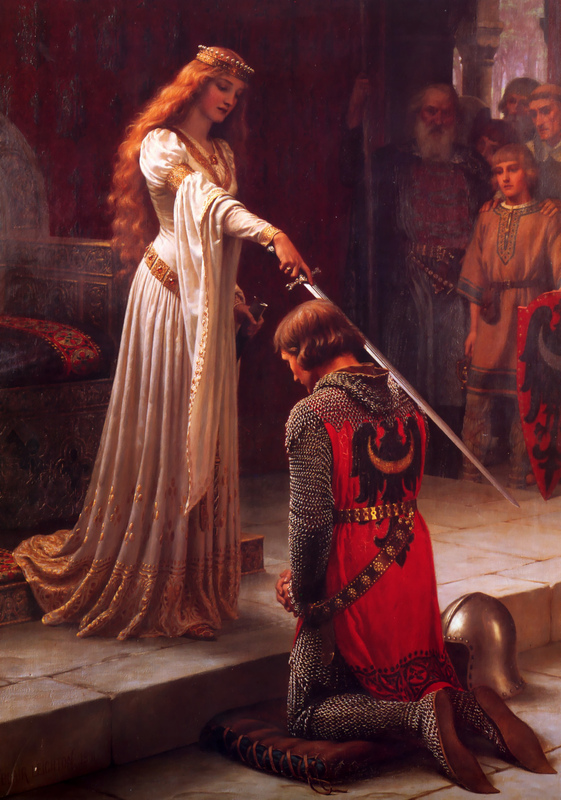 He gave everyone titles in his mythology and strove to change the publishing house into King Arthur’s court. 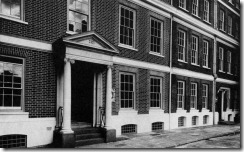 The picture at the left shows Amen House, where the London branch of the Press had its offices. Meanwhile, Charl es and Florence were in love. He was already twenty-three years old and had never loved before, but had spent his youth creating an imaginary world that was half-Dante, half-Malory: a strange combination of religious and chivalric love in which the Beloved was viewed as her unfallen self and also as a ladder to climb towards God. He tried to fit Florence into this complex literary-romantic system, making her the object of his affections, faith, and poetry. Very quickly, perhaps even over the first month of their acquaintance (the chronology is disputed), he wrote a series of 82 sonnets called The Silver Stair. He handed them to Florence one night. They were about giving up love. I have blogged about The Silver Stair previously, and will do so again. While they are not amazing literature, these poems are extremely important for understanding Williams’ development as a writer. This book was published in 1912, and while CW did not give up love, he dragged out their engagement for nine years. During those years of courtship, Charles wrote two books of complex love poetry, involving themes of renunciation and the sanctifying power of love. Apparently Florence mocked him for reciting poetry loudly in public; he nicknamed her “Michal” (after King David’s wife; see II Samuel 6:14-23) and the nickname stuck. 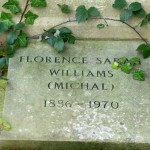 She even published one book as “Michal Williams,” and “Michal” is engraved on her tombstone. In 1914, World War One broke out. CW was unfit for service because of his poor eyesight and a neurological disorder that caused his hands to shake. His two close friends from college, Harold Eyers and Ernest Nottingham, along with most of the other young men of his generation, were killed. This shook him to the core. He felt they had died in his place, and he took this pain into his signature doctrine of Substitution and Exchange (of which more as we proceed). Michal and Charles finally married on April 12th, 1917. In September of 1917, Williams was initiated as a member of the Fellowship of the Rosy Cross. I won’t say much about occult society here, as there will be many posts about the F.R.C. on this blog in weeks to come (d.v.). But what a year! To consummate love, plunge into the disappointments of domesticity, and begin the rituals of an occult secret society all at once would have been nearly too much for either a lesser or a greater man. As it was for CW, these influences crept into his work only little by little. He was a bit of a late bloomer. His poetry remained mundane for many years yet; the occult only shows up loud and clear in his novels years later, after he left the Order. His mind seems to have worked on a slow percolation, taking years to process experiences. In 1922 Charles and Florence’s only child, Michael, was born. Charles began to lecture on literature through the London County Coun cil at the Holloway Literary Institute in the evenings, adding “teacher” to his vocations as editor, poet, and playwright. He wrote one of his strangest books, Outlines of Romantic Theology. It was not published during his lifetime—no wonder, as its theories about practicing the life of Christ in sexual relationships are very odd indeed. In it, CW postulates a sacramental practice of marriage that is more literal than the Church has ever described it. I will, of course, summarize and analyze this book in its proper chronological place. Then in 1924 fate struck again. 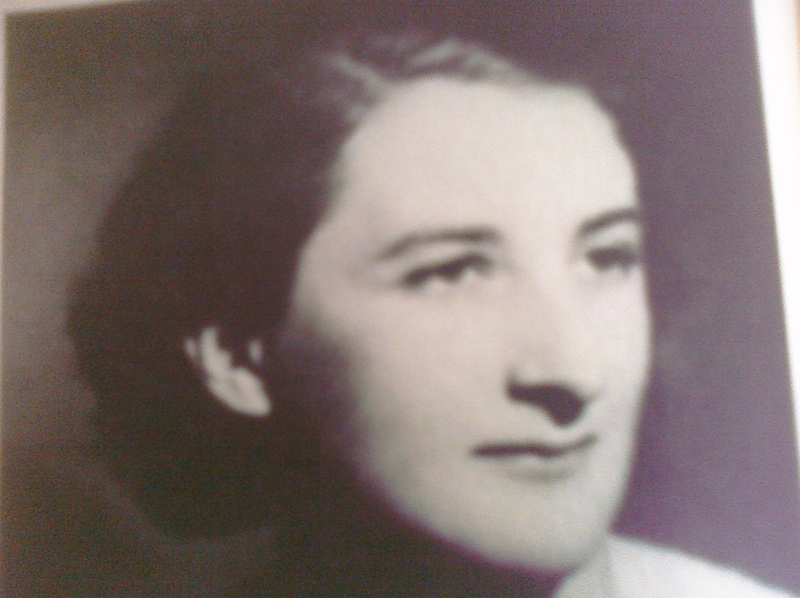 Phyllis Jones joined the staff of the Press as librarian—and Charles fell in l ove with her. So much for Romantic Theology. For the next nineteen or so years, Phyllis was his muse, his torment, his subject-matter, the index to his ideas, and the center of a revised Theology of Romantic Love. I will write more about her in due course; her photo is above. Throughout the 1920s and 30s, CW wrote many biographies and most of the novels on which his reputation primarily rests. In 1939, Britain went to war against Germany, and Hitler began bombing London. The Oxford University Press was evacuated from London to Oxford to escape the blitz, and another season of CW’s life began. It was to prove the most fruitful phase. Come back next week to read about Williams’ years in Oxford, his friendship with the Inklings, and his great final works. This entry was posted in Biography and tagged bio, London, love, Michal, Oxford University Press, Phyllis, Romantic Theology, Rosy Cross, war. Bookmark the permalink. I think my tweet says it well: From C.S. Lewis to Williams after reading one of Williams’ books of poetry: “After this you will not be surprised to learn that I found your poems excessively difficult.” What a strange man! Yes, well said, indeed. Trust CSL for just the right words. But trust CW for the inspiration! Lewis had some weird friends and associates, no doubt. Barfield: cultish anthroposophist. Harwood: ditto. Baker: ditto. Brother: alcoholic. Mrs. Moore and Joy: no comment. Tolkien: Tridentine Catholic. Williams: just plain weird. WW I had an effect like no other event in recent memory. Yet look what came from such craziness and trauma! Greg: That is an AMAZING summary. 🙂 But isn’t that the beauty of human friendship, and even more so of The Church? We get to be best friends with weirdos (or we get to be weirdos who have friends)! I think your comment about the beauty of human friendship being that we get to be best friends with weirdos or the weirdos who have friends (even better!) is quite profound. I’ve been working with a couple of churches in recent days and listening to the usual complaints made by members about each other. If only we could recognise that we are the weird ones who have been gifted with the most amazing friends. Hey! The family have just started dancing to Fleetwood Mac! Time to go! Enjoying this blog, Sørina! This entry especially was helpful and intriguing (but they all are). You are filling in a lot of blanks for us about his life and works. One thing I have to say about CW’s prose style: not only is it labyrinthine or sinuous, but sometimes there are passages that can be nearly poetic or at times abstract with almost mathematical descriptions about love or the divine which confound me. And sometimes he has sentences that simply jar the reader. I will await what you have to say about his “histories” because I find them unpalatable and stranger than fiction (in terms of style and structure). His poetry is unique and fascinating, and I do love his spiritual thrillers. Thanks for your work so far with this blog! Thanks, Jonathan! Yes, you are exactly right: he does wax so poetic and/or mathematical and/or philosophical that he’s very hard to follow. Hang in there: we’ll go chronologically through his works over the next year or so, but I want to get some introductory matter taken care of first. Thanks for reading! I forgot to re-post the second and third installments of this Charles Williams bio. Fascinating, intriguing, and well-written! You always desire to make sure you have enough information to fill a 400 word essay. The idea behind writing for comedy is easy enough to know – make people laugh – but the sun and rain that cause something that is certainly truly funny are complex and varied.